Sorry for the the delay in writing this. 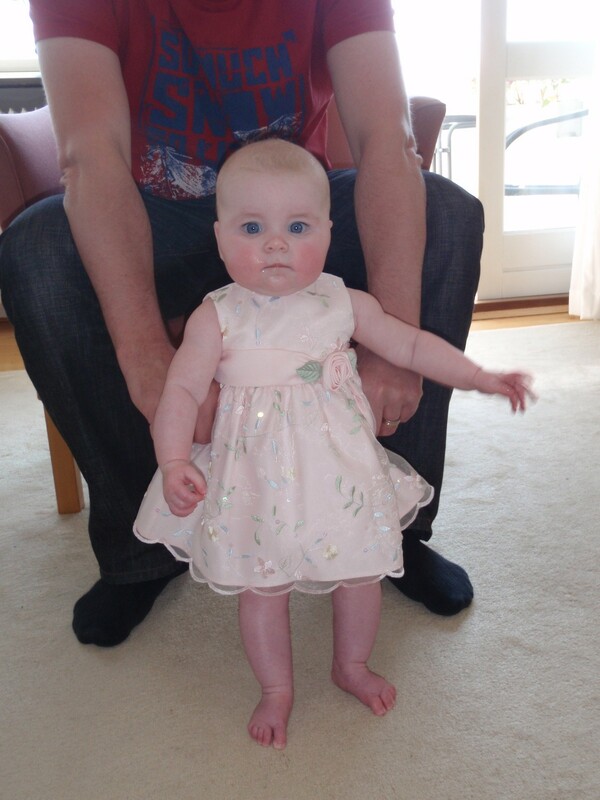 So Elizabeth was less than 5 months old when we took her on her second holiday. We went to Denmark for Easter to see the family and again Elizabeth was pretty good on the plane. Unfortunately we had a much later flight out than when we went to France so when we landed, Elizabeth should've been in bed. This really seemed to mess her up as she couldn't settle well enough in the buggy whilst traveling on the trains that we needed to take to get to Frans' sister Laura's house. This was torture for me as there didn't seem to be anything I could do to help her. She did fall asleep once we were off the second train and walking. By this point I think it had been a couple of hours since we had landed so Elizabeth was pretty knackered. 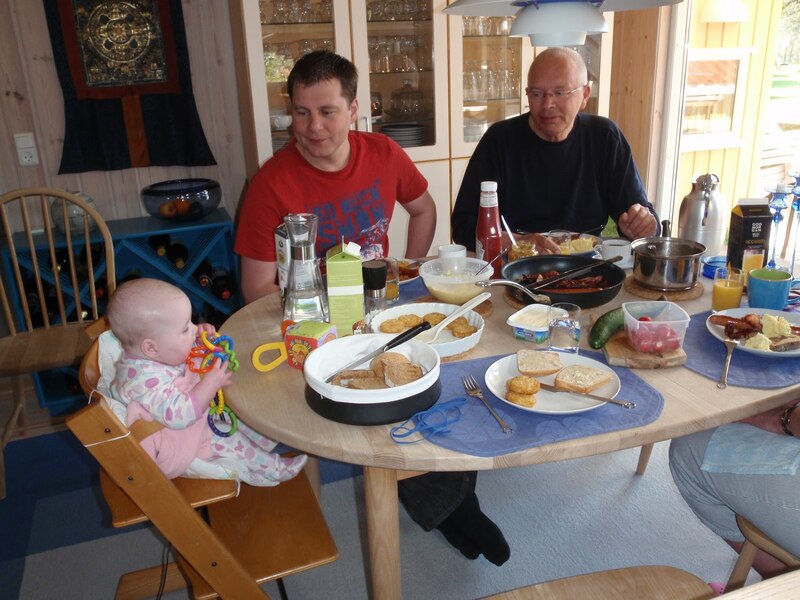 We were borrowing a car and car seat from Laura so we got the car packed as quickly as possible then started the 1hr 20m drive down to the summer house in Nysted. We were starting our holiday with a short stay with Inger and Bruno. Elizabeth slept for most of the car journey but fed and went down to sleep easily once we arrived at the summer house. I believe that Elizabeth actually slept pretty well on that first night. In the few days leading up to this trip, Elizabeth had started to sleep for between 8 and 10 hours in one go. This trip didn't really disrupt that and she continued to sleep well on most of the nights that we were in Denmark. Result! Elizabeth had a few 'firsts' on this trip - her first giggle, her first time in a high chair - and she really seemed to enjoy her holiday. It was wonderful watching her. We had a fab few days down at the summer house with some gorgeous food - thanks again Inger - then headed back up to Copenhagen on the Sunday for Jonas' confirmation. We haven't seen the boys since last summer so this was the first time that they had met their niece. Anders and Jonas were keen to have a cuddle and we had a lovely day with them. We put Elizabeth in a gorgeous pink party dress that my cousin gave her. Adorable, of course! On the Monday, Elizabeth met some more family members. We spent the afternoon with Kris and Dwight and they were a big hit with Elizabeth. She also met a cat for the first time. We had a really chilled out day and then headed back to meet Laura and Ulrich. Unfortunately we did have a few problems with Elizabeth at this point. 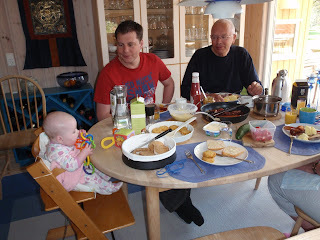 We had a lovely breakfast the next day with Laura, Ulrich and the kids, then it was time to go home. We had some fun going through security at the airport - never again are we going through the desk that has staff training - but eventually made it to the gate. Elizabeth wasn't too happy about being on a plane again and didn't want to sleep until we started the descent into Gatwick. She then slept in my arms until we picked up our bags!